The National Armada Memorial, The Naval War Memorial, Smeaton's Tower and the Drake's Statue. The Plymouth Naval Memorial is situated on Plymouth Hoe, overlooking Plymouth Sound. The National Grid Reference is SX 477 539. 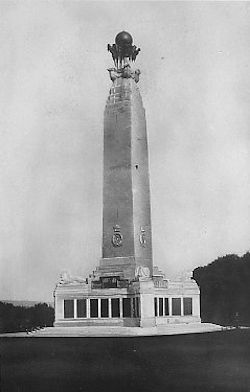 The Memorial, which is sometimes referred to as the Plymouth Naval War Memorial, is the responsibility of the Commonwealth War Graves Commission. Following the Great War (1914-18), the Imperial War Graves Commission, as it was then known, was asked to find an appropriate way of commemorating the men who had died in the War but who had no known graves. This was relatively easy with soldiers, it was decided, as they could be remembered by memorials erected on land near where they fell. However, for the Royal Navy, whose deaths occurred at sea, this posed a problem. 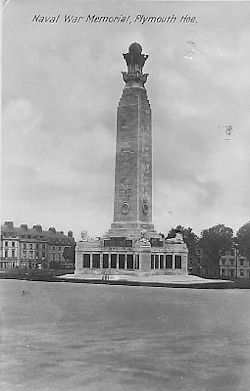 It was solved by constructing a similar memorial in each of the three ports from which the Royal Navy's ships were manned -- Chatham, Plymouth and Portsmouth. The design would be of a unique naval form and each would serve as a marker for shipping. The south and east faces of the pre-Second World War Memorial..
Sir Robert Stodart Lorimer (1864-1929) was invited to design the memorials. He had been responsible for the design of the Scottish National War Memorial in Edinburgh and several war cemeteries in Germany. on Plymouth Hoe, as it was before the Second World War. The memorials are as planned and comprise a central tower of Portland stone supported by four corner buttresses, surmounted by lions couchant. Towards the top, the tower branches out into four ships' prows. The statuary at the top of the tower represents the four winds that blow: the angry north, the fair south, the cruel east and the kindly west. This supports a large copper sphere representing the globe. These features were sculpted by Mr Henry Poole although they were originally designed by Mrs Gertrude Alice Meredith Williams, a well-known sculptress from North Tawton, Devon, who was unable to carry out the work on the full-sized model. On the buttresses in this original part of the memorial are brass plaques upon which are cast the names of over 7,000 sailors who lost their lives in the Great War. On the sides of the tower is inscribed the names of the principle naval engagements of that War. The memorial was unveiled on Tuesday July 29th 1924 by Sub-Lieutenant HRH the Prince George, who landed at Pottery Quay, Devonport, from HMS Ursula during reserve fleet exercises. After the end of the Second World War (1939-45) it was decided to extend the memorials to commemorate the dead of that War. For Plymouth this was to be means of a curved sunken garden on the inland side of the memorial. This was designed by Sir Edward Maufe (1882-1974), who was the Imperial War Graves Commission's architect after the War. He had designed the Air Forces Memorial at Runnymeade and also Guildford Cathedral. At the entrance to the memorial are statues of Neptune and Amphitrite with sea horses, designed by Mr William McMillan. The central panel of the wall bears the inscription: ~ All these were Honoured in their Generations and were the Glory of their Times. ~ On either side of this are two sculptures by Mr Charles Wheeler of sailors on the alert. On the end walls are figures of a Royal Marine and a member of the Maritime Regiment of the Royal Artillery, both by Mr William McMillan. 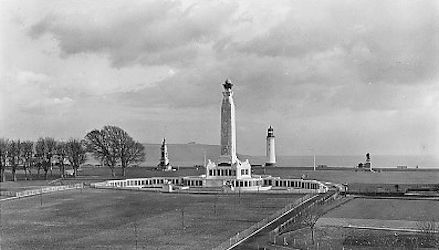 The original memorial had commemorated seamen from Australia and South Africa but when the extension was added other Dominions wished their names to be added. Consequently a new dedicatory panel was installed on the seaward side. Those sailors who served with the Royal Indian Navy, the Royal Canadian Navy and the Royal New Zealand Navy are commemorated on memorials at Bombay, Chittagong, Halifax and Auckland. The sunken garden, with panels containing the names of a further 16,000 men, was opened at 2.30pm on Thursday May 20th 1954 by HRH the Princess Margaret. One further ceremony took place on Sunday November 11th 1956, when Admiral Sir Mark Pizey unveiled panels honouring those who had died on shore but who had no known grave.